Located on Whitechapel in Liverpool City Centre and home to roughly 40 stores and service, Metquarter is the third largest shopping centre in the city, behind Liverpool One and St. John's Shopping Centre, but ahead of the boutique arcade; Cavern Walks. Metquarter has been called the 'Bond Street of Liverpool'. Metquarter is home to the 21,000 sq ft (2,000 m2) Flannels flagship storeand is also home to outlets of the following brands: Armani Exchange, Billabong, Diesel, DKNY Jeans, Firetrap, Hugo Boss, Levi's, Peter Werth, Sasson Salon, Timberland and Tommy Hilfiger amongst many others. 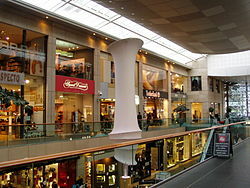 Besides retail outlets in Metquarter there is also a Costa Coffee, Cafe Rouge and illy.